Musings of The Mom Jen: Our Lucky Day! Home > Adventures, Baseball, Family, sports, Things I Love > Our Lucky Day! Despite all the SHAT that has been going on with the illness, side effects, and my downer posts lately, we did have a fantabulous day Saturday. 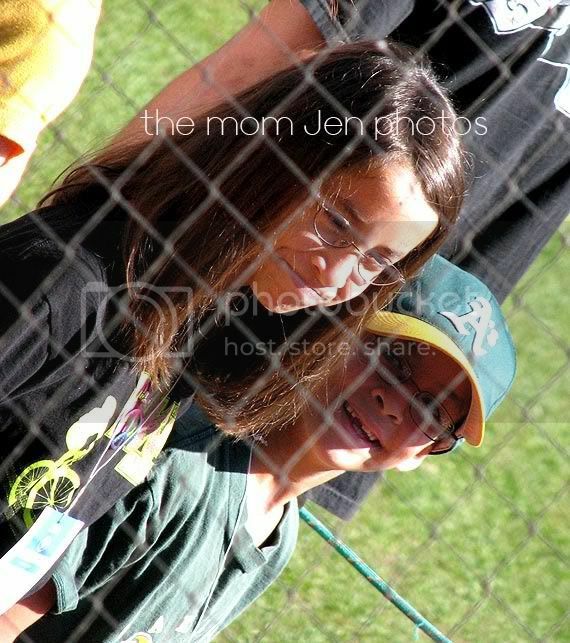 My friend Merrie (Sleepless Mornings)gave us free tix to an Oakland A's game and we were thrilled. My hubby has been a fan since his youth, and frankly My Boy can't pass up a stadium hot dog for anything! 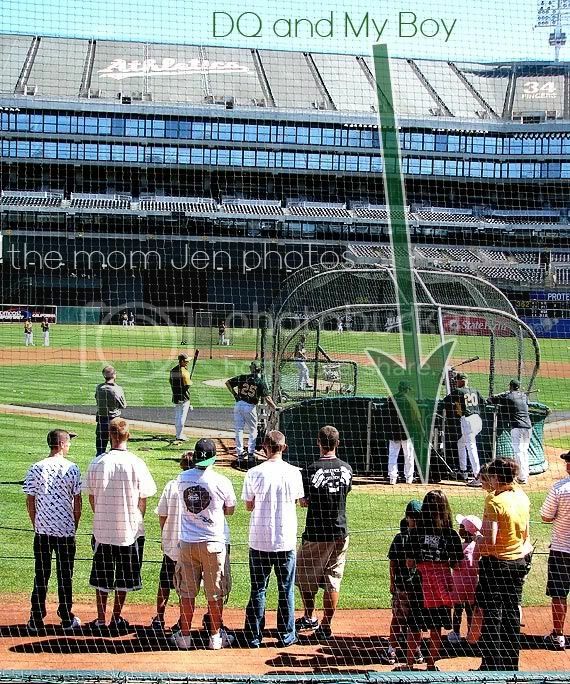 So we get their early and luck out-we get to watch batting practice which is always cool! Soon after finding our amazing seats, an A's Ambassador comes over and asks if the kids want to go ON the field and watch BP!! The kids are on the field taking in the view from just behind home plate, very cool! 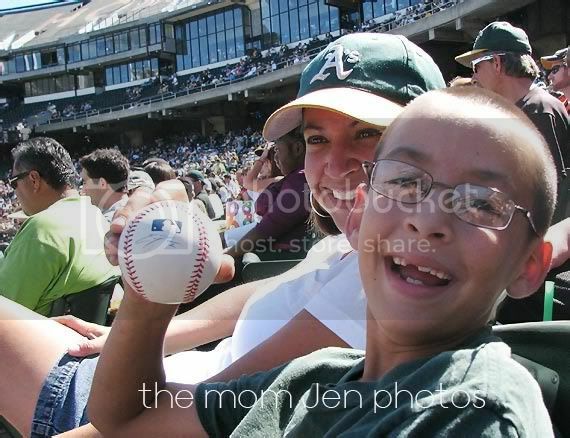 Soon after, another A's rep comes over and hands My Boy a BP ball! 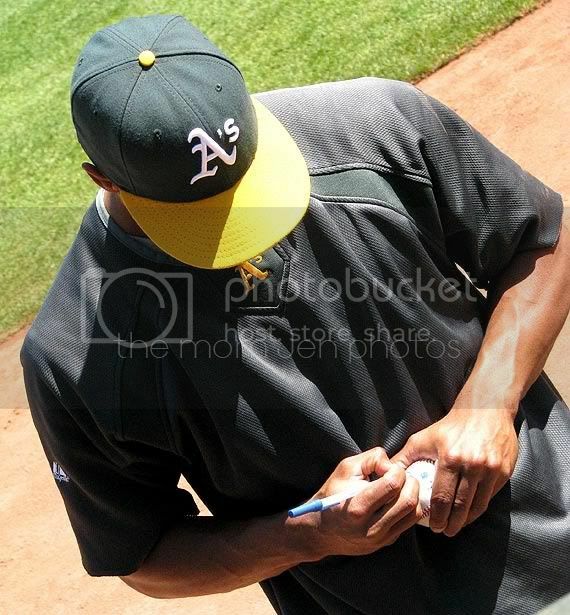 Our seats were so close to the A's dugout, My Boy and I hung out and tried to get some autographs. Luckily Eric Patterson was hanging out, so we grabbed our new ball and tossed it over the dugout for some signage! 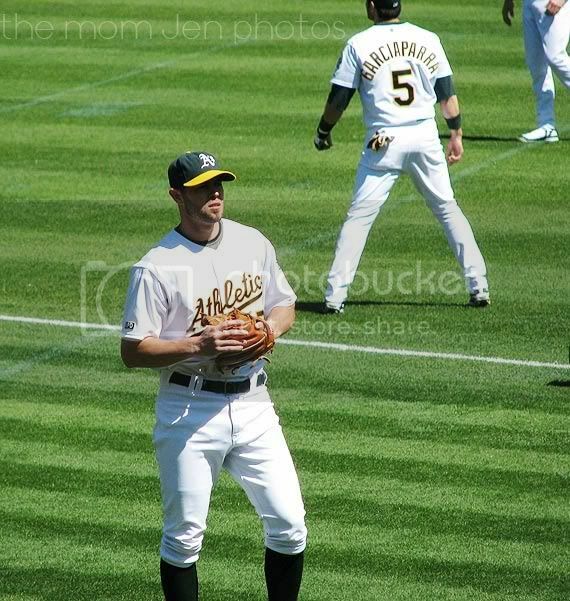 And of course, I snapped some pics of my personal favorite player...Bobby Crosby. 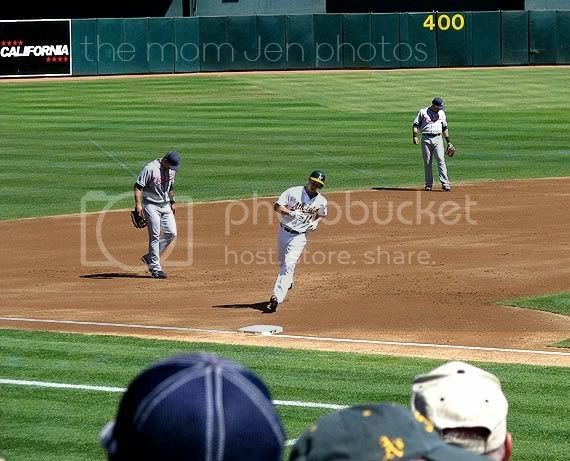 First inning we see 4 runs score for the A's plus a homer from Mark Ellis, woot! If that wasn't enough...another pair of A's reps came over to us and asked if we'd like to participate in the Chevron DiamondVision game in the 6th inning. 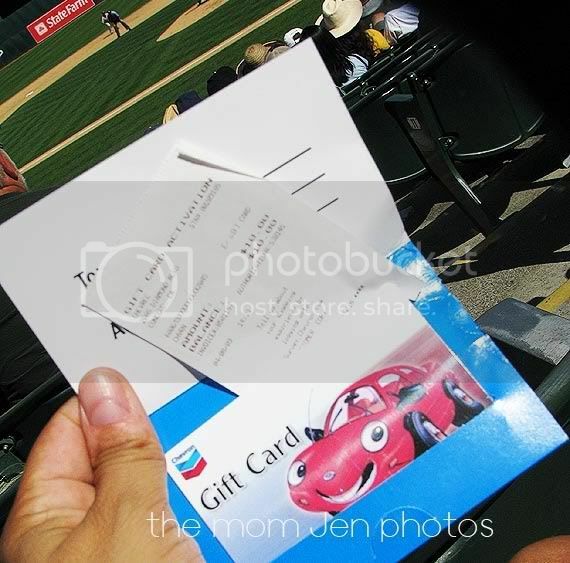 3 fans get a chance to win a $100 gift card for gas! We couldn't pass this up, so Hubby reluctantly agreed, since I had to take photos. 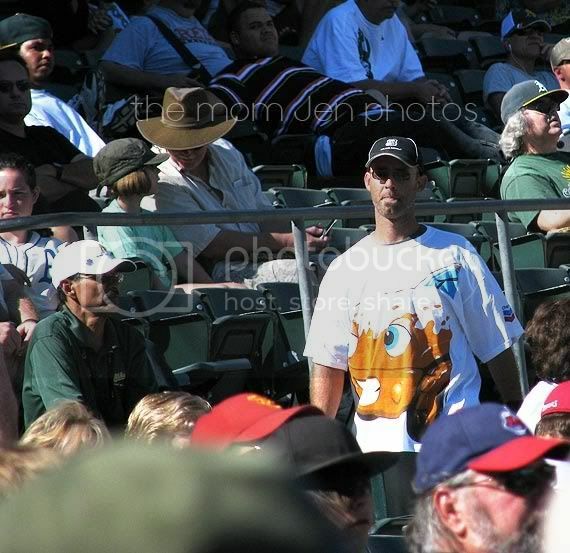 Hubby gets whisked away to the other side of the stadium and dons a Chevron car tee! 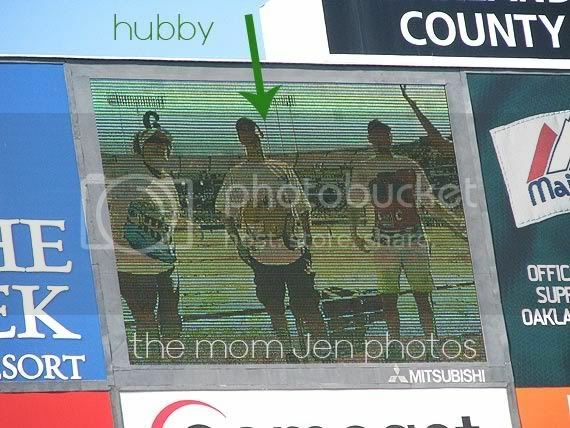 Then the computer-game is played on DiamondVision...and Hubby is then shown with his opponents! Unfortunately, the car he represented, Muddy Maddie, did not win, but for his good sportsmanship he wins a $10 gas card! It was an amazing day, and the A's beat the Indians 8-4, which means that every fan got a free 2-liter of Pepsi from their sponsors...I also found 2 A's merchandise cards in my wallet for $33 that i've had for over a year so the kids got a A's pullover. I'm thinking with that luck, I should have purchased a lotto ticket! Sounds like a wonderfully fun and lucky day. We got to a Phillies game in July, and I wanted to get back, but here it is almost playoff time (and they will be in the playoffs) and we have not been back! sounds like such a great saturday. :) glad you got to go! free tickets always rock!! Is that YOUR wonderful smile I see there with your son? I'm so happy to see you in a picture. It looks like a fantastic day! Yay! You needed some good times with all the sickness & stuff going on lately. I'm glad you all had a great time! That is awesome! Sounds like a great time! WOW! Lucky you...what a day! Your pictures were fabulous. You definitely should have bought a lottery ticket that day! Did you have a big neon sign over you saying "pick me! pick me!"??? Wow! That sounds like a great day. You should've bought a lotto ticket. Wow, what an awesome day!!! Yeah, lotto tickets are definately in order! I am part of THE TRUMP NETWORK! Check it out here: bit.ly/team77 Your gonna love it!